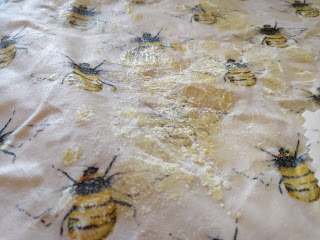 I love the idea of reusable clingfilm. 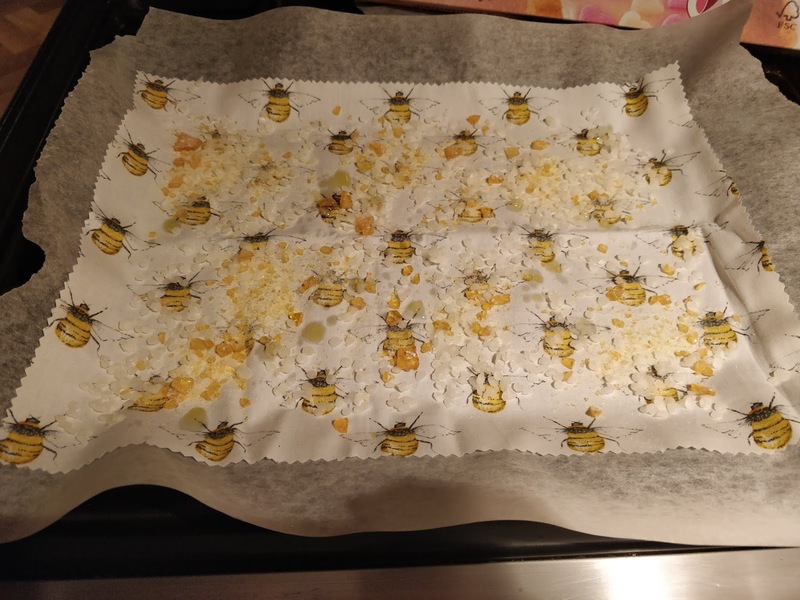 When my colleague Naomi's birthday was coming up, I decided I would give making some a go - she is a big fan of the bees and I knew she'd appreciate it. Unfortunately her birthday was last month, but, well...nevermind. I searched around on the internet and decided to give this method a go. 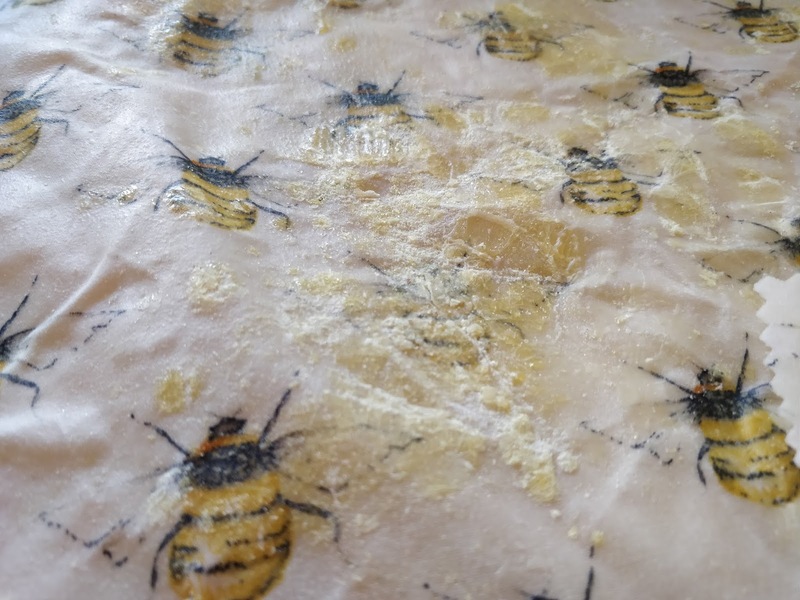 It uses jojoba oil and pine rosin as well as beeswax, to make the finished article a little sticky so that it stays put when you wrap it over a bowl. 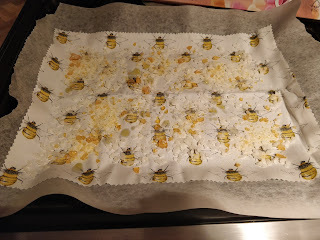 I bought beeswax chips, jojoba oil and a bag of broken up pine rosin from Amazon, thinking I would just grind the pine rosin up as necessary, since the powdered stuff only came in much smaller quantities. My first attempts were not all that good. It worked, but not as well as I'd hoped. As many of the commenters complained, the pine rosin didn't melt properly and the finished product was patchy and looked weird. We've been using them, but they're probably not fit for giving away. I tried a different method on Sunday and I think I might have nailed it. 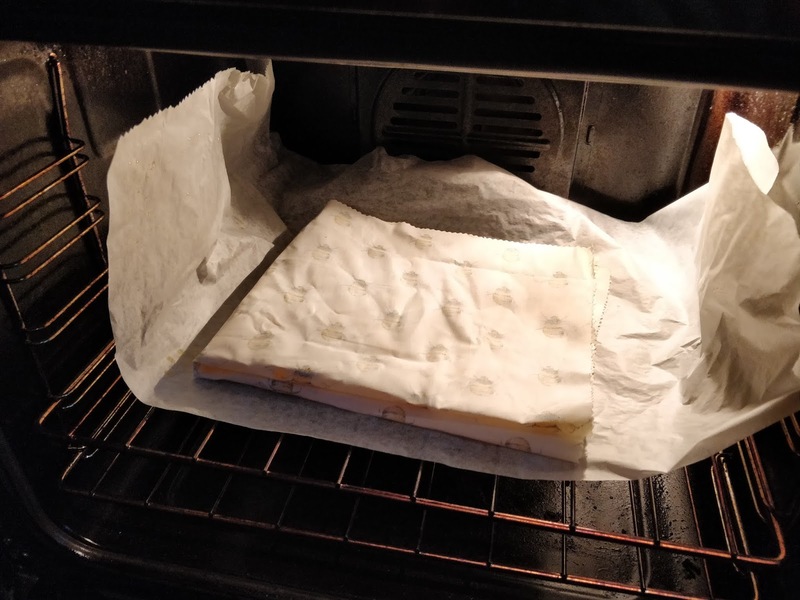 Further reading on the topic suggested that pine rosin melts at a higher temperature than the wax, so I put equal parts wax and pine rosin in an old can and put it in the oven until it was melted - it went in at 180 degrees because my lunchtime chicken was cooking in there, which was probably too high, but I checked it often. Then, I brushed it all over my fabric. 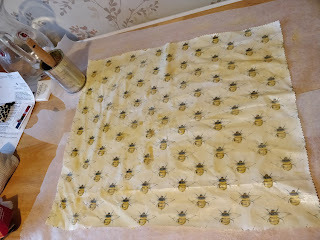 Once this was done, I put the fabric in the oven for the wax mixture to remelt and soak all the way through. I cut fabric much bigger than my oven this time, so I had to quarter the fabric to fit it in - but I unfolded it as soon as I got it out of the oven and it worked OK. This was still leaving me with a very saturated sheet of fabric, though, so on my final try I adjusted again. This time, I cut two squares of fabric the same. I painted one (probably a bit less thoroughly than the others as I had almost run out of wax mixture) and put it in the oven; when I got it out, I immediately laid it onto the untreated piece of fabric, which soaked up all the excess. Et voila - a perfectly impregnated wrap. 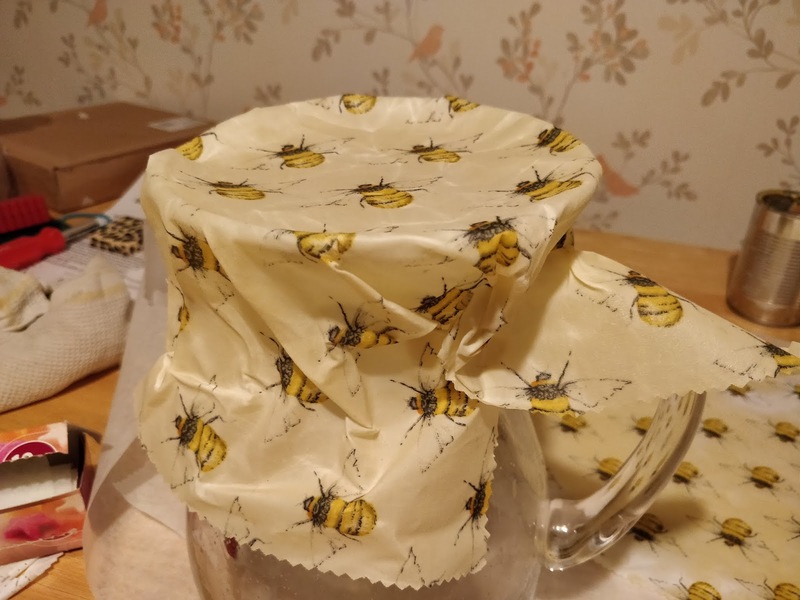 I think I will try this method again next time I have a bit of time and inclination to have another go.